If you haven’t heard of W&P Design, they make all sorts of kits for food and booze lovers. We already covered some, like their brilliant hot sauce DIY kit and Carry On Cocktail Kit that is great for when you’re traveling. 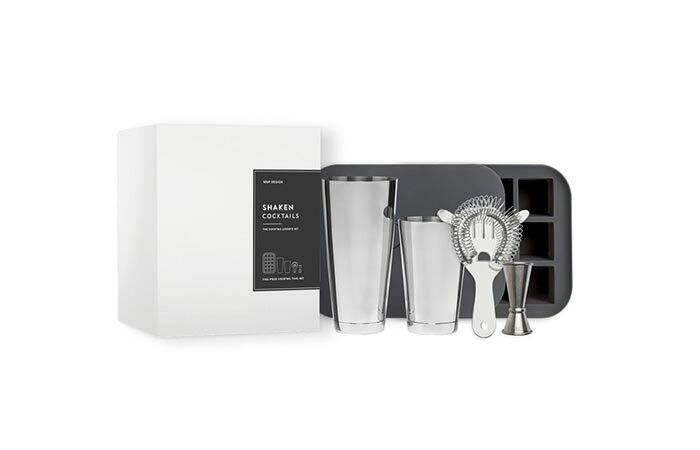 Now we have one more perfect for those of you who love experimenting with different recipes – Shaken Cocktail Set. Just like the rest of their sets, this one comes with all the necessary ingredients to prepare one hell of a drink. To be more precise, it includes a jigger, Hawthorne strainer, cocktail shaker and an ice cube tray. These essentials are enough to create your own home bar. Everything looks elegant and comes packed in a nice branded black and white box. Also, if you lack inspiration for cocktail recipes, you can check their Shake book and get ideas in no time. If you need an addition to your home bar, check out Shaken Cocktail Set. It contains everything you need for a killer cocktail.